Do you believe in luck? Do you believe some people are more lucky than others? Where do you think these people get their luck from? What if luck was not something that happened haphazardly every now and then to random people, but an ability that you could use to your own advantage. What if you found that you had an exceptional ability for luck that could grant you everything you wanted in the world. And what if somebody tried to take that ability away from you. What would your life be without your good luck? And what would you do to get your luck back? 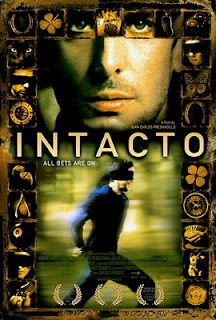 From the very first seconds of the opening scene of Intacto, you immediately realize you are watching something different. Something special. And something wonderful.